I modified my dough recipe a bit this afternoon, as well as tested out baking them with a variety of different toppings to make sure the toppings didn't burn during the baking process. For the last few days, I have been eating the first test batch that I made last week (without any toppings), and love them lightly toasted and spread with cream cheese. I have also enjoyed them as "bagel toast" (without the holes) along with my eggs in the morning. 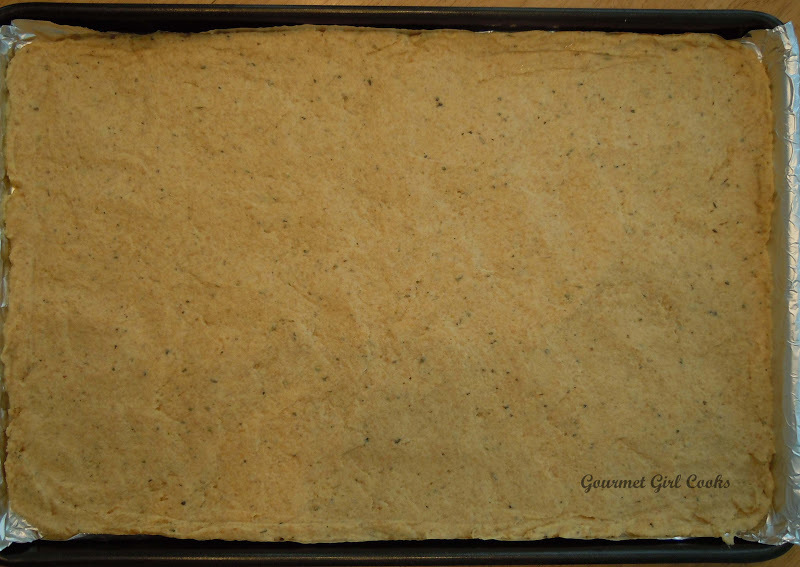 Because this recipe has herbs and seasonings added to the dough, they have a nice subtle flavor just as they are, without any toppings. This recipe makes savory (not sweet) bagel squagels/bagel toast. If you wanted them to be more on the sweeter side instead, simply omit the Italian seasoning, garlic and onion powder, salt and pepper and replace it with the amount and sweetener of your choice, cinnamon or raisins (if you eat them)...you could even mix in some dark chocolate chips or nuts and could also top them with nuts or coconut, etc...whatever you like. 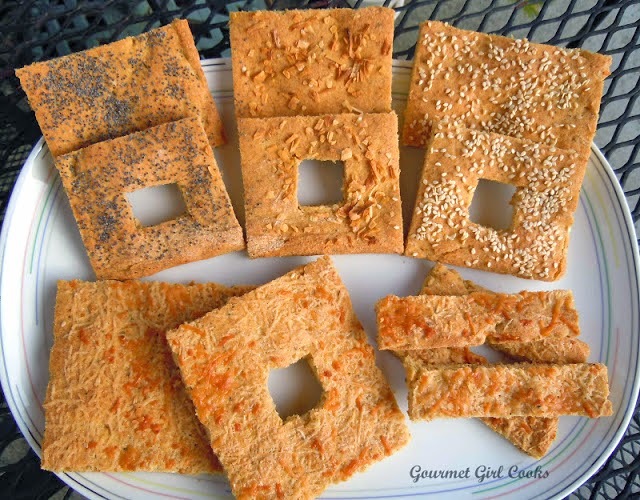 Besides not having to buy a special pan to make "round bagels", the part I like best is that BOTH the top and bottom half of these Bagel/Squagels have the topping on them (since you don't cut them in half to toast and eat them) -- each "square" equals 1/2 of a bagel which makes it like eating 2 top halves (the best part in my opinion). I always hated choosing a particular flavor of bagel that I really liked and then only getting to enjoy the flavor when eating the top half while the bottom just sat there being "plain and boring" -- not any more! Whether you cut holes in them or not, I think they are delicious lightly toasted and spread with cream cheese. They also make delicious "bagel toast" (if you don't cut holes in them) so you can enjoy eating them for breakfast or with eggs in the morning (which is what I probably miss the most). I don't really miss eating sandwiches any more, but sometimes you just want a bagel or some "toast like bread" to spread cream cheese on, or to go along with your scrambled eggs in the morning. So far, from my limited experience trying to make a "loaf" of wheat/grain free bread, I have not yet been impressed enough with them to go through the laborious task of making them again any time soon. I may revisit that again in the future -- but for now, I'll just enjoy my Bagel/Squagels or Bagel Toast...both with and without the holes!!! 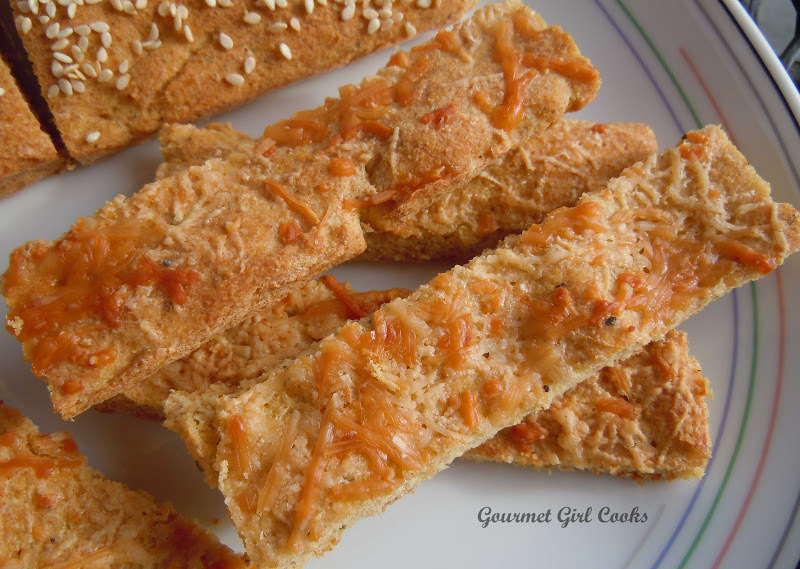 Besides making the Bagel/Squagels and Bagel Toast...I also made a few Bagel Sticks which would easily make nice softer, slightly crisp bread sticks, especially when topped and baked with cheese. 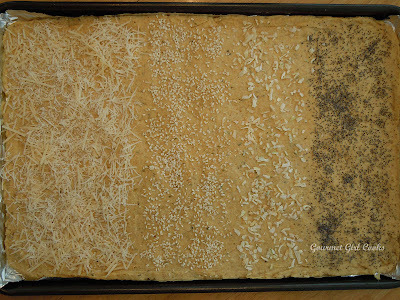 With this one batch of dough, spread out in a large 17" x 12" baking/cookie sheet, I was able to test 4 different flavors of toppings. I made poppy seed, toasted onion, sesame seed and my hubby's favorite...Asiago & Parmigiano Reggiano cheese bagels. I cut the bagel bread in this pan into a total of 12 medium 3"x3" Bagel/Squagels & Bagel Toast squares...and 2 jumbo 4-1/2" x 4-1/2" cheese Bagel/Squagels squares for hubby as well as 4 smaller 1" x 4" Bagel Sticks (or bread stick) pieces. They are about 1/2" thick and filling (not heavy). Even though 2 pieces would equal a whole bagel...each time I have put 2 pieces on my plate to eat them, I was full after eating just one piece along with my coffee...so don't spread the cream cheese on your 2nd piece until you've finished your first, just in case you end up doing the same. :-) If you decide you'd like to try making them a little thicker, then use a smaller baking pan so the dough is spread out thicker -- you may have to adjust the baking time though. Below I've included the recipe along with some pictures. I really hope these help satisfy your "bagel tooth"! Enjoy! 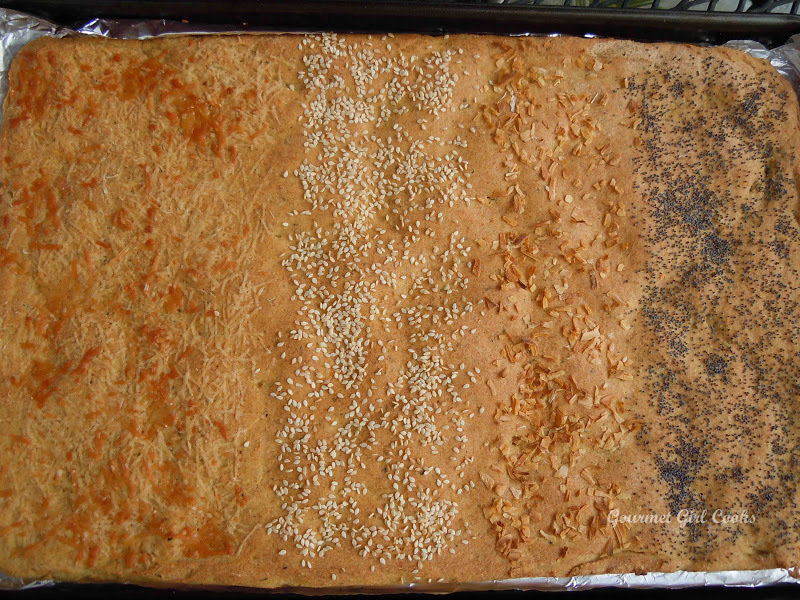 From this batch of dough, I made 4 pieces/squares each of poppy seed, 4 onion and 4 sesame seed, 2 large pieces/squares of the Asiago/Parmesan and 4 bagel sticks! Preheat oven to 400 degrees F. Line a heavy 17" x 12" baking pan or cookie sheet with non-stick foil or parchment paper sprayed or brushed with oil (I prefer using non-stick foil). In a medium sized bowl, mix all dry ingredients together with a whisk to help break up any lumps; add eggs, water, oil and apple cider vinegar; mix well. Dough will be thick and somewhat sticky. Using a rubber spatula sprayed lightly with oil, place the dough in the center of the baking pan and begin working your way out toward the edges, spreading the dough out over the entire surface of the pan as evenly as you can (the dough will be about 1/4" - 1/2" thick when spread out). If desired, sprinkle with your favorite toppings on top (poppy seeds, minced onion or garlic, sesame seeds, Asiago cheese, etc.). Bake for 30 minutes or until the bagel bread feels done when pressed near the center. This makes a thinner 1/2 to 3/4-inch thick "bagel bread". When the bread is done, remove from oven and let cool. 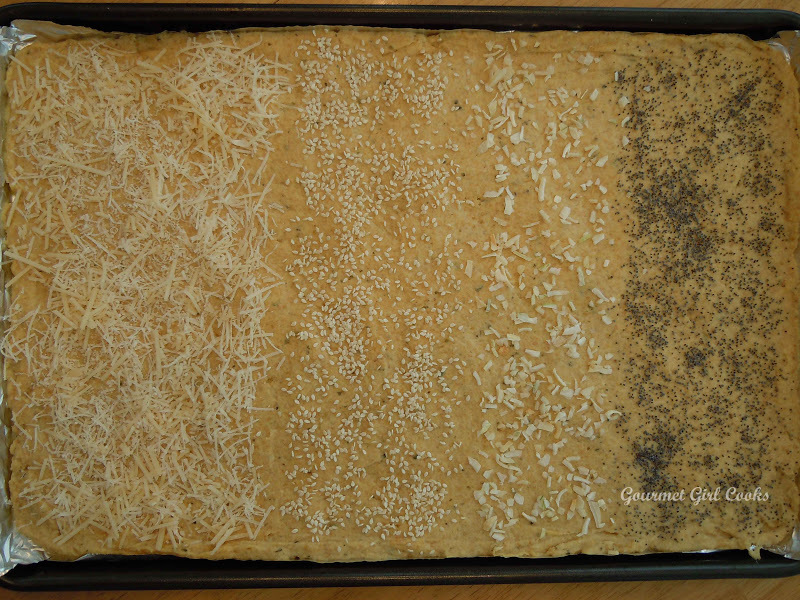 Slide the entire loaf, along with the foil, out onto a cutting board. 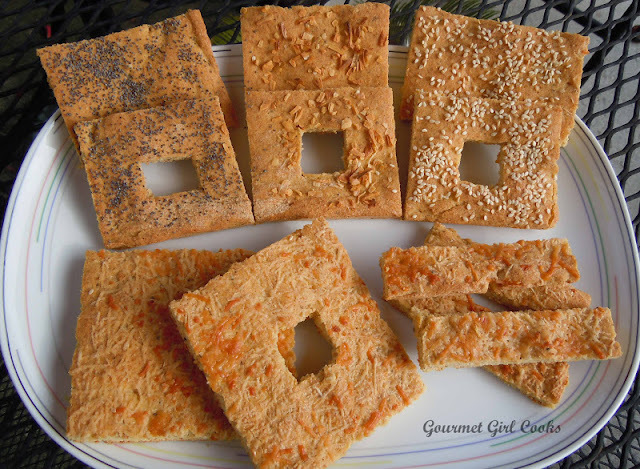 Using a sharp knife, cut into "bagel/squagel or toast squares", in the size of your choice (if making bagel/squagels, cut small square holes in the center of each using a sharp knife). Each "square" is the equivalent of half of a bagel. Toast and spread with cream cheese or butter, if desired. ***Note: Don't worry about tasting the apple cider vinegar; you won't taste it at all. It's in there to help leaven the dough a bit. Hi. Your blog is so fabulous! I stumbled upon it when Dr. William Davis gave your eggplant ricotta recipe a huge thumbs up on his Wheat Belly blog. Your grain free/gluten free recipes are so creative and helpful. So I have been craving bread so badly and I was salivating looking at your photos of the bagels/squagels. I ran out and got the ingredients and baked a loaf tonight. It was DELISH! It totally hit the spot. And even though I had a huge chunk, I don't feel too guilty because I know the bread won't spike my blood sugar. Your recipes are amazing and I plan on trying many more of them. Thanks for sharing! You are amazing --- thank you! You are absolutely a gourmet artist! Ever since you mentioned your epiphany in the middle of the night about the squagels I have been watching and waiting for this recipe. I can't wait to make them tonight! I follow you regularly since discovering you on WB blog and your recipes are the best! Thanks so very much for sharing your artistry and expertise. Hi Wendy -- No, I haven't tried using baking soda in this recipe. How much would you suggest using in this recipe based on your experience with it? What is the amount/ratio of baking soda & vinegar? If you test it with the soda, let me know how it works! I agree with you -- I am not wild about coconut flavor in more savory type of baked goods! Thanks! Made the recipe this afternoon and they are DELICIOUS! Husband is delighted! Thank you! How would I go about making them Cinnamon Raisin? Made these this morning and they are amazing ! One question though....how would you store them ? Well...I would keep out a couple days worth (mine are wrapped on the counter or you could put in the fridge) and what I did with some of mine was to lay them flat in a gallon size Ziploc bag and stack them if you need to and freeze (might want to keep the same flavors together if you made different flavors. Let me know if you have any advice to pass along about your experience with storing them. I had 2 pieces of the "bagel toast" with cream cheese and coffee for breakfast this morning...and was in heaven! :-) So glad you like them! Hello and thank you so much for your wonderful blog. 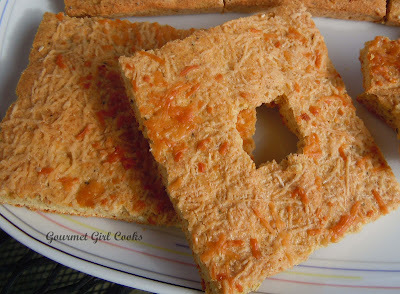 I have enjoyed making your pizza recipe and now I found another winner with the bagel toast! I made it this morning and decided to recreate the “everything bagel” and mix all the toppings together. Almost like a flatbread – delicious. Thank you for sharing your recipes and beautiful photos! I am enjoying your Blog very much. My husband is allergic to Almonds, what other wheat free flour could I substitute and ge the same results? Thank you! There are other nut flours you can purchase too, although the only other one I've used is hazelnut flour -- but I think you need a milder tasting nut flour. You could try subbing additional flax for the almond flour or check out "www.nuts.com" to see if there is another nut flour you'd like to try. Either way, I would test it by making only 1/2 a batch first. I believe there is peanut flour, cashew flour, etc. Let me know if you decide to substitute the almond flour for something and how it turns out -- so I will know in case anyone else has the same allergy. I first came across your recipes in the Wheat Belly blog and finally had the time to make the Squagels earlier this evening. The recipe worked well in the 9 x 12 baking dish that fit my counter top convection oven. Thank you so much for the incredible effort and time you put into creating these recipes. "An earlier poster asked about how long the "squagels" would keep and I thought I would pass along my results. I made them Tuesday afternoon and after they cooled I put them in a Ziplock One Gallon Storage Bag in two layers with a piece of waxed paper between the layers making sure I got as much air out as I could when I sealed the bag. I did not refrigerate or freeze - just left the bag sitting on my kitchen counter. It's now Sunday evening and the remaining pieces are still fresh and moist. I will say that after a couple of days the waxed paper seemed to be drawing moisture from the squares so I took it out." I am such a fan of yours. I go to your blog every day and have tried many of your recipes and LOVE them. I have been gluten-free for 3 months now and I've been able to do it because of you. Thank you! Can I sub white vinegar for the apple cider vinegar? Thinking of making this, but thats the only ingredient I'm short. Hi there -- I hope your husband likes them. If you want, you can add less toppings to them -- or no topping at all. If you don't like the seasoning in the dough, you can change or reduce that too -- that way they would be more plain and you could enjoy them with peanut butter, etc. I made these recently and there was a faint bitter after taste. Could that be the flaxseed? The only other time I used flaxseed it had a similar taste. Is there something I could substitute for the flaxseed flour? Hi Louis! Did you use brown flax or golden flax? I only use golden flax because it is much milder than the brown -- I don't care for the brown for that reason -- the underlying bitter taste. Also, when you buy flax...after you open it, it should ideally be kept refrigerated so it doesn't become rancid which tastes AWFUL! I don't know if you could substitute all the flax for something else -- possibly, but it may need other tweaking then. If you are using golden flax...you could try swapping the amounts -- 1-1/2 cups almond flour and 1 cup flax to see if that helps -- I just don't know what that will do to the consistency. Some people like to bake with coconut flour -- but you have to use LOTS of eggs because it dries things up. There might be a way to substitute some of it with that but the measurements would change -- especially the liquid. If you try something else and it works...let me know! Thanks! I did use Golden Flaxseed flour and it was a new bag. I will try changing the amounts as you suggest and see what happens. Hi GG, tonight is the night ( sounds like song) that I will try to make the bagels. I am missing *deli-style* triscuits! My topping will be caraway seeds. I will omit the Italien seasonning mix. Do you use an egg wash to keep the seeds and onions in place? Thank you GG. Barbara from California. Hi Barbara! I don't use an egg wash, I typically just lightly press the toppings in with my hands before putting it in the oven -- but an egg wash would probably help them stick better! 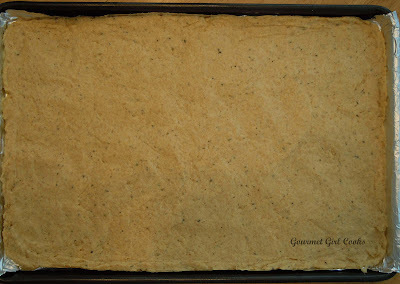 If you have parchment paper, you might want to lightly spray it with olive oil and place on top of the dough "blob" in the middle of your pan and use a flat object or your hand to smooth it out -- it doesn't rise much, so make it close to the thickness/thinness you want it to be. The full recipe makes an entire sheet pan of 1/2" thick or so bagel bread/toast...last night I just made a 1/2 batch of it since it is only me eating it. Unfortunately, my hubby still eats regular wheat bagels! He just can't (or won't) give them up! :-) I hope you enjoy them and they turn out good -- let me know how it turns out if you try using an egg wash! These look fabulous! I can't wait to try them. I have to watch my cholesterol, so do you think liquid egg substitute (like egg beaters)would work? I was just wondering if you think chia seeds would work as a substitute for the flax. BTW, I love all your recipes. Thanks for all your hard work & sharing :)!! Hi I was just checking in to let you know that I decided to try using sunflower seed flour instead of chia seed meal to replace the flax seed meal in the recipe and it worked great. It tastes absolutely delicious!! I just ground raw sunflower seeds in my vitamix by pulsing but you could use a coffee grinder too. So just wanted to let you know the results for those who have an aversion to flax meal. And once again thanks for an awesome recipe. Hi--I made these this morning and they were so yummy, especially after they completely cooled. They became more "bread" like, compared to when they were still warm. I have Swerve sweetner, how much would you recommend using in the recipe? 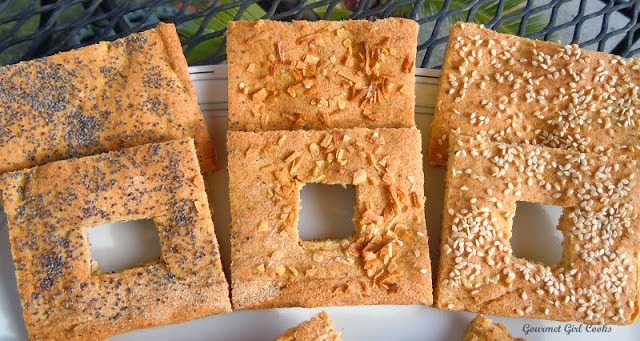 Seems like it would be fun to eat the bagel/squagel inside square too! Not sure what to call it, but somewhat akin to donut holes!! These sound great and I'm looking forward to trying the recipe. I'll probably make mine as the bagel/squagel sticks. I hope you enjoy them. Those were some of the first bread/bagels I made when I went grain free. I've since created several other recipes (biscuits, powr bagels, rolls, etc.) that you might enjoy as well.